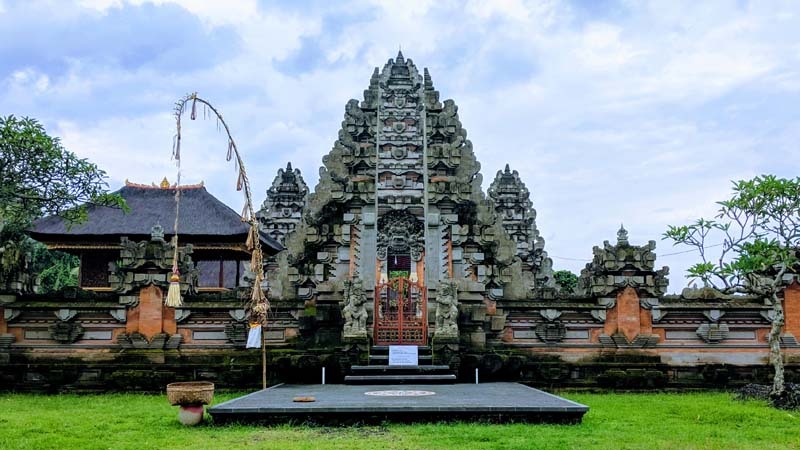 This is part two of my Beyond Belief project, where every month during 2019 I plan to experience a different religion that I know nothing about. This month its Sikhism. I have to admit, this one I knew absolutely nothing about. 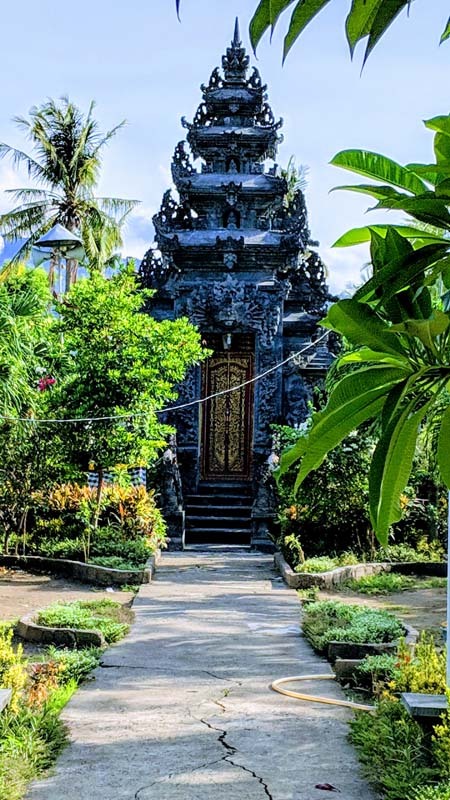 There is a large temple-looking place not far from where I live so I dropped in the other day to see what it was about. 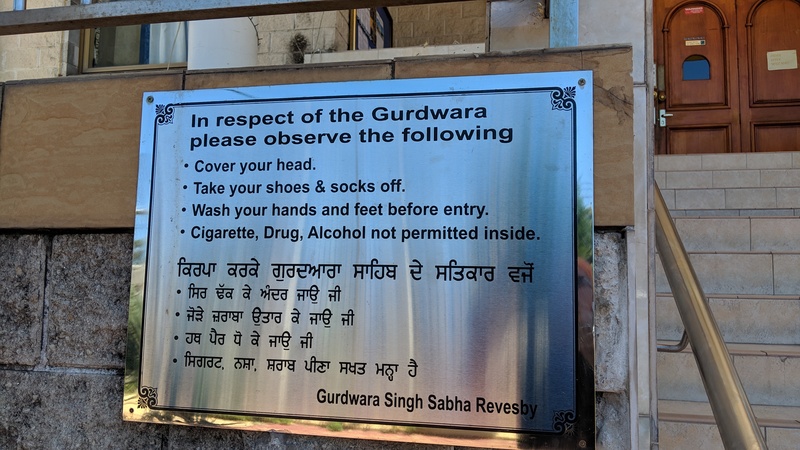 Turns out it is a gurdwara, which is a temple for Sikhs. The only thing I really knew about Sikhs was that they typically come from Northern India and they wear turbans (at least the men do). I’d never really thought that being Sikh was a stand-alone religion, and just assumed it was some offshoot of Hinduism. That’s definitely not the case. 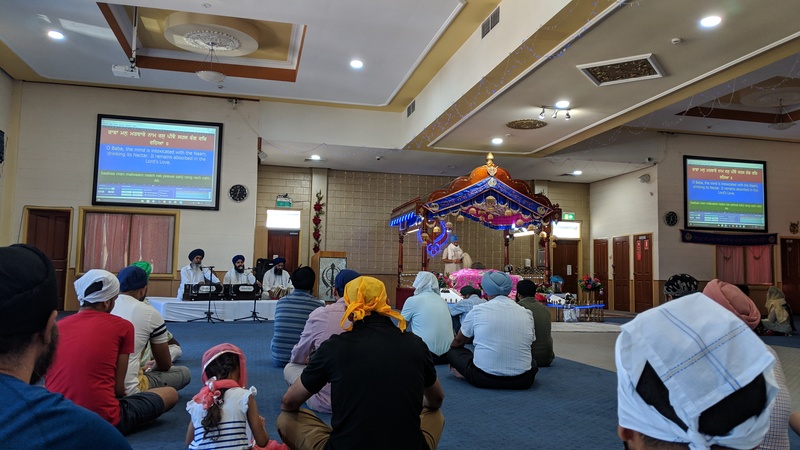 When I dropped into the gurdwara to take a look, there was a guy with a beard and turban near the entrance measuring up a noticeboard, so I approached and explained that I am trying a different religion every month this year. He put down his measuring tape, then spent the next 90 minutes showing me around, explaining the religion and telling me about the beliefs. His name was Padam, and he was super helpful. 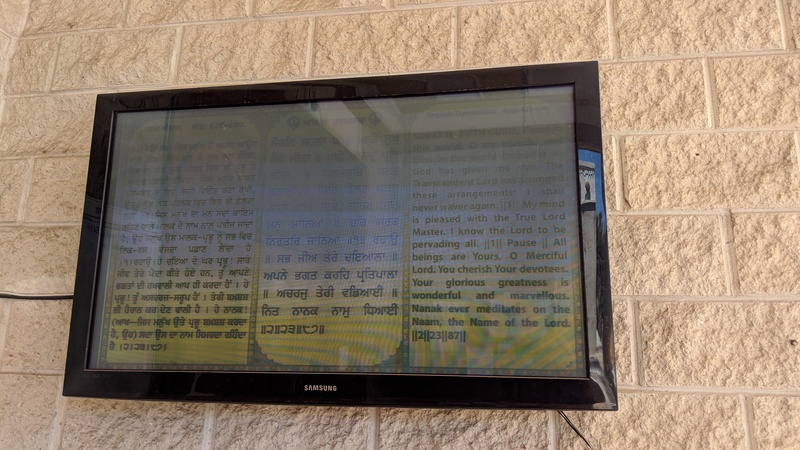 He pointed out the large TV screen near the entrance that displayed a piece of scripture for the day, and Iearned that it came from the Guru Granth Sahib, which is the Sikh holy book. It displays a different piece of scripture each day, which is made available from “the opening” of the book at 4am each morning, until 8pm each night. Padam suggested that if I read it, it would contain a personal message that I needed to hear because of me turning up on this day at this time. I read it and maybe I just missed it, because I’m not sure I gleaned anything particular. Maybe it’s just me. 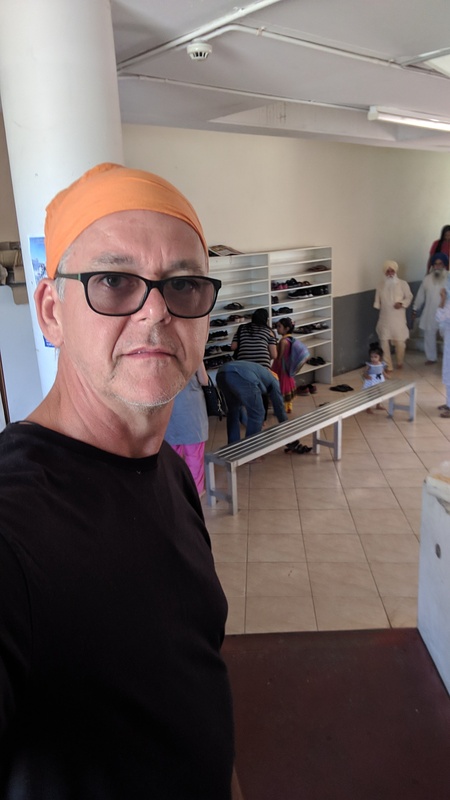 I took off my shoes and put on a head covering and we went into the gurdwara, knelt in front of the holy area where the Guru Granth Sahib was kept, and Padam told me lots and lots of stuff about the Sikh religion. He stressed that the Sikh religion is extremely egalitarian, and treats every human with respect and reverence. A good Sikh, he told me, is peace-loving and is blind to race, to colour, to nationality, to gender. Every human, regardless of who they are, is equal and welcome. 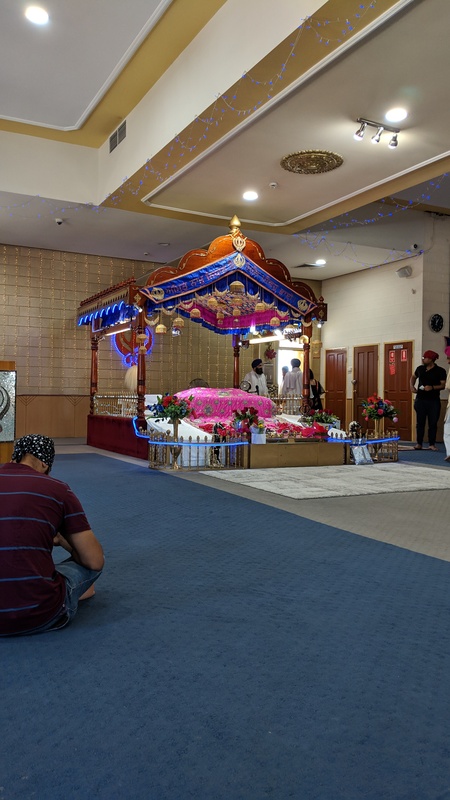 Sikhs are welcoming to all other religions, and even though they have been persecuted and even executed over the centuries by Muslim and Mughal invaders, they still harbour no ill feelings towards other religions or races. I learned that the word “Sikh” actually translates as “learner”. Does that make me a Sikh? Probably not. But I was definitely learning. I learned that Sikhism is a monotheistic religion (one god) but that god is a universal god, acknowledged as the same spiritual creative force as recognised by other religions. The message of this god is communicated through Gurus, starting with the first one, Guru Nanak in the 1500s, and then a succession of other Gurus who became the messengers of this god on earth. 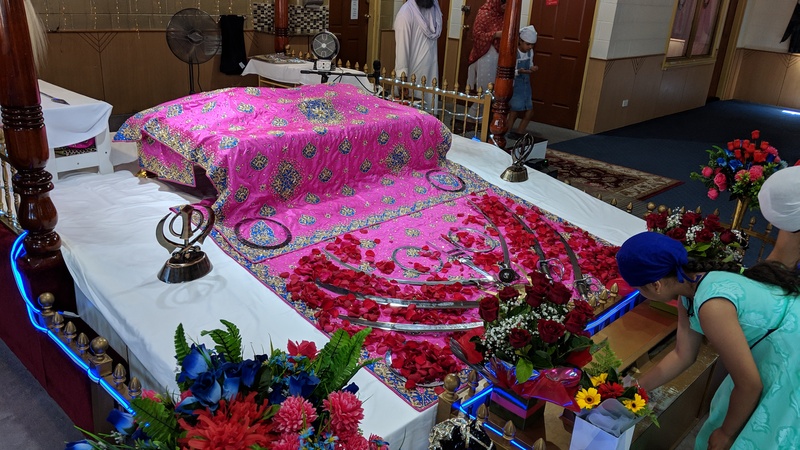 The holy book, the Guru Granth Sahib, was steadily edited and extended by the successive line of gurus that followed, each adding more wisdom to it. I asked Padam who the current living guru was and he pointed to the book, which I didn’t really understand right away, but it turns out that the tenth guru, Guru Gobind Singh, named the book as his successor, and the book itself has been “the Guru” ever since. (India is famous for outsourcing, but I never expected something like this!) The book is treated as a real living human person, complete with a real funeral when a copy gets too old to keep using. The other thing I learned about was “The 5 Ks”, or the symbols that every practicing Sikh carries with them at all times. 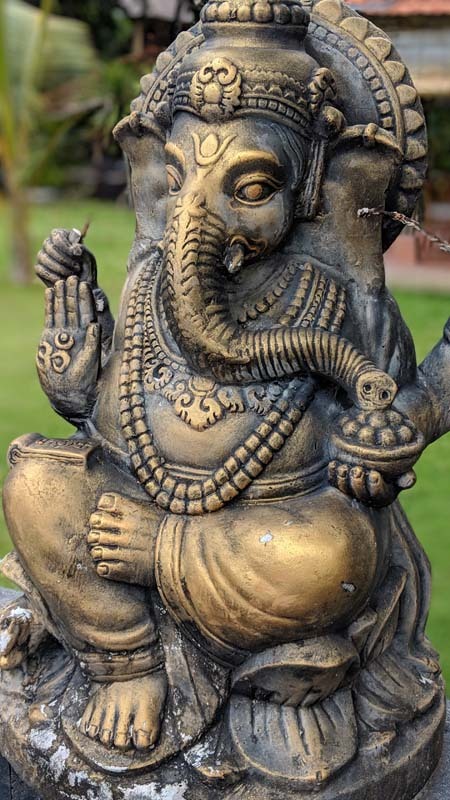 They are kēs (uncut hair, which is why most Sikh men have beards and under the turban usually long hair), kaṅghā (a small wooden comb kept in the hair), kaṛā (circular steel or iron bracelet designed to both represent the eternal nature of god, but also to represent a handcuff, connecting them to god), kirpān (a small sword or dagger carried on their person. 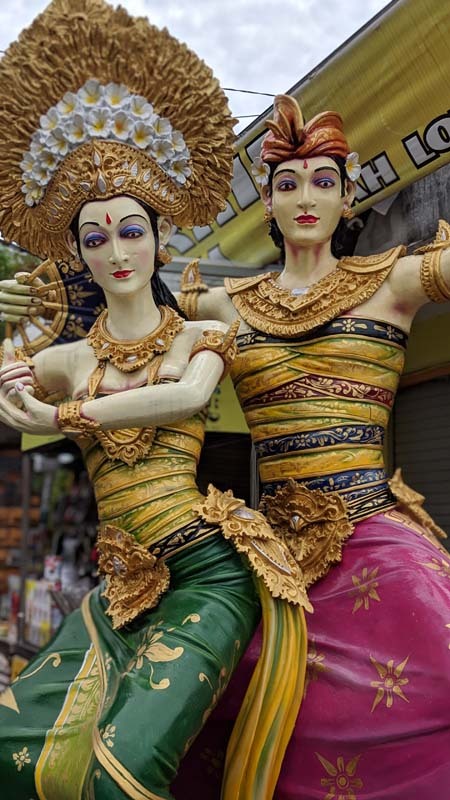 Padam said that Sikhs have special permission to carry the dagger under Australian law), and kacchera (the special underpants designed to remind them of chastity and faithfulness). Things must come in fives because there are also five things that Sikhs try to avoid. 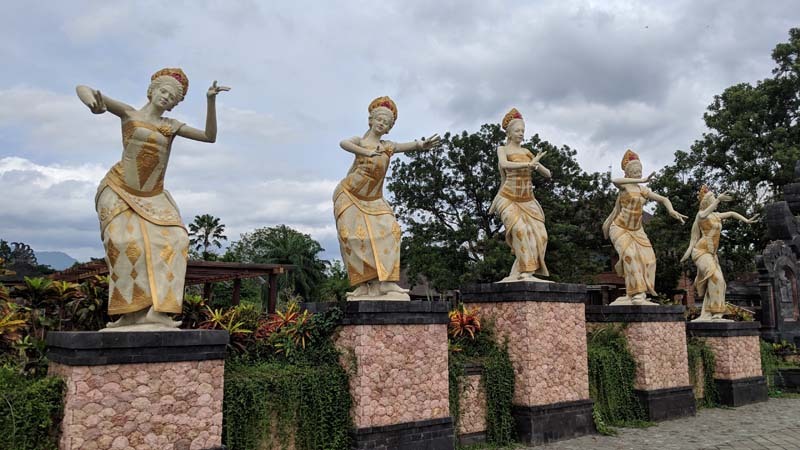 They are referred to as the “Five Thieves” – Lust, Anger, Greed, Attachment, and Ego. 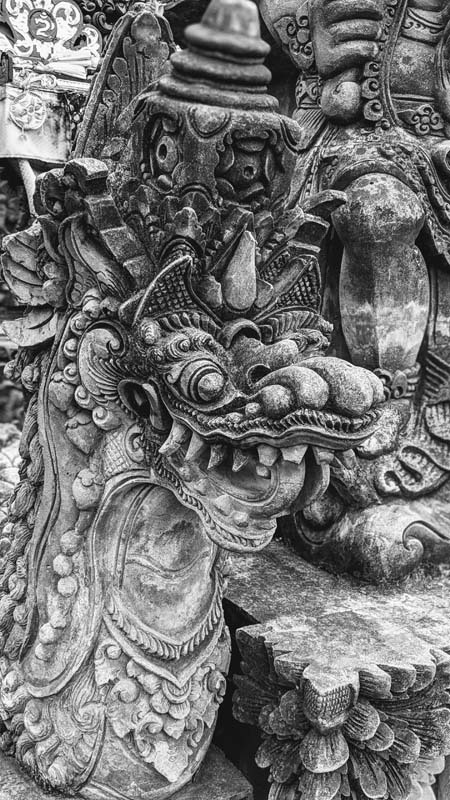 Padam spent quite a bit of time explaining the meaning of these and the effect it has on the way they approach life, but I probably can’t do it justice in this blog post, which is already getting long! The wikipedia article about Sikhism is very good if you want to learn more. Before I left, Padam invited me to come back on Sunday to experience part of the Kirtan certemony and stay for Langar. 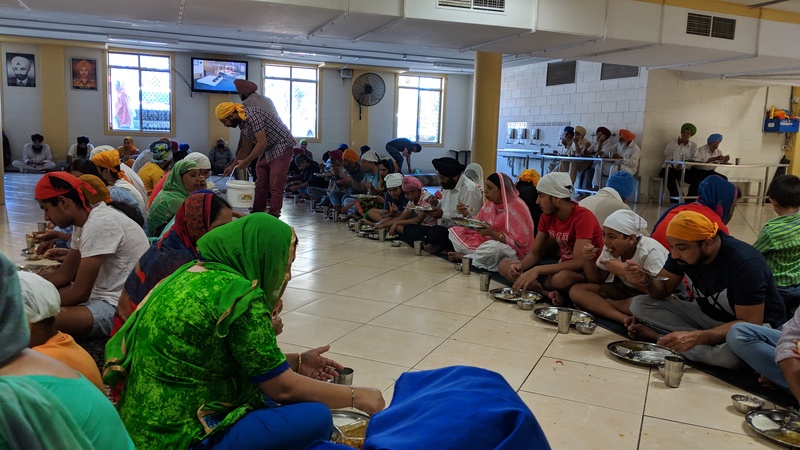 I turned up at about 12:00pm and sat in on the holy prayers being sung, then the scriptures being read, before heading downstairs to join Langar. 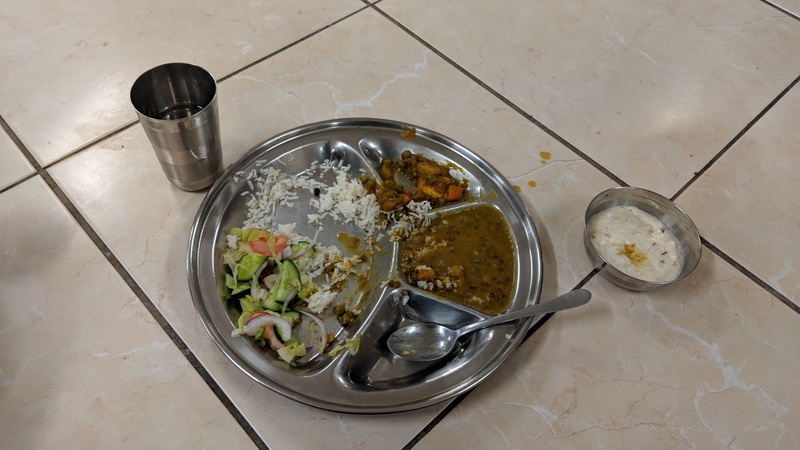 Langar is a community meal, provided free to anyone who turns up. You sit on the floor with rows of other people, with a large metal dish in front of you, and people come around and put food on it. It’s all vegetarian, with dhaal, flatbread, rice, aloo, and salad. It’s quite the communal experience. So that’s my investigation to Sikhism. 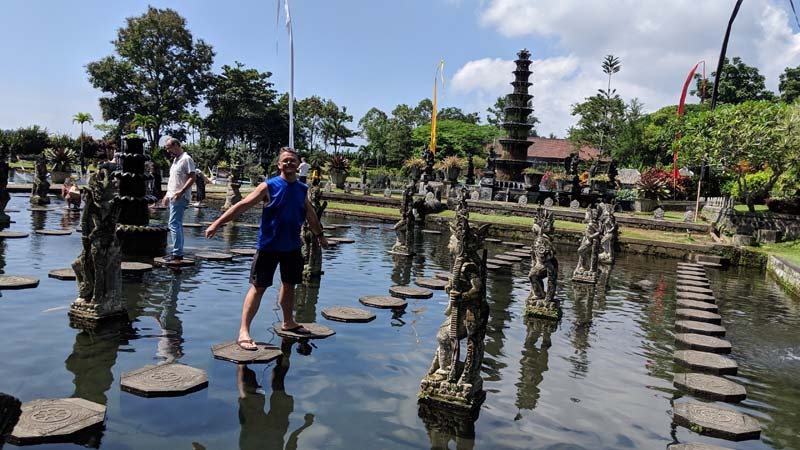 It struck me as a really nice religion that has a whole lot of interesting traditions, history and beliefs, and some very friendly and welcoming people. I’m not about to convert (to this or any other religion) but I’m glad I checked it out and know a little bit more about it now. Now, which religion will I try next month? Leave a comment with your ideas! 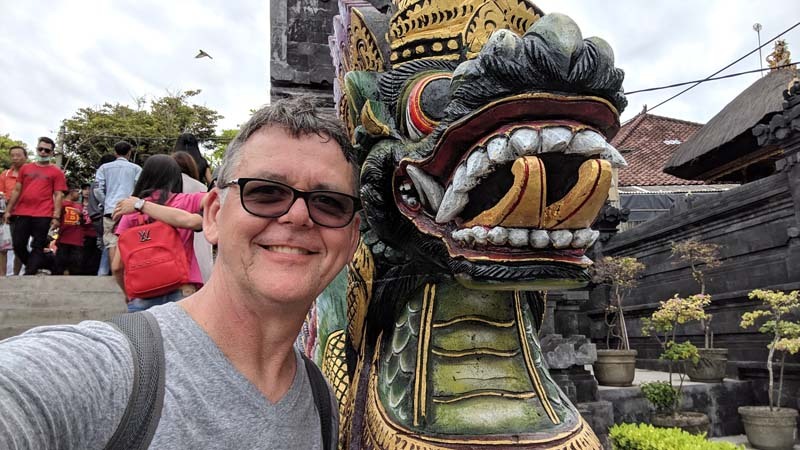 Also, I’d love your comments on this project of trying a different religion each month. Is it a good idea? A dumb idea? Is there something you think I should do differently? 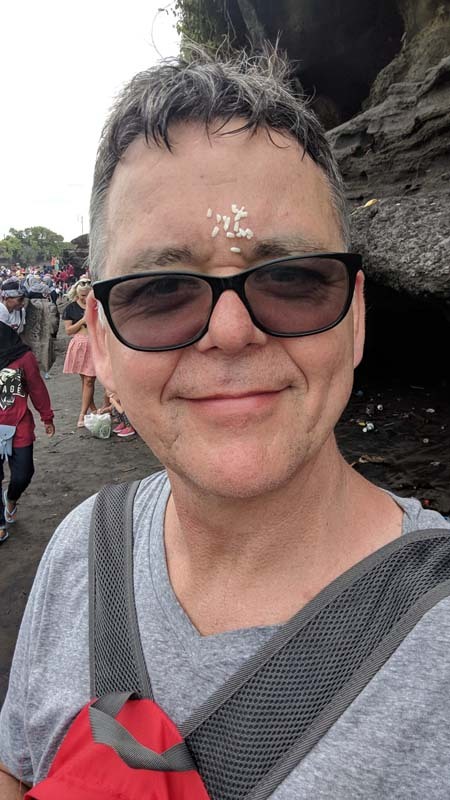 Here we go with part one of my Beyond Belief Project, where I plan to experience and learn about a different religion every month for all of 2019. I’m a little late posting this one, as it was for January, but better late than never. 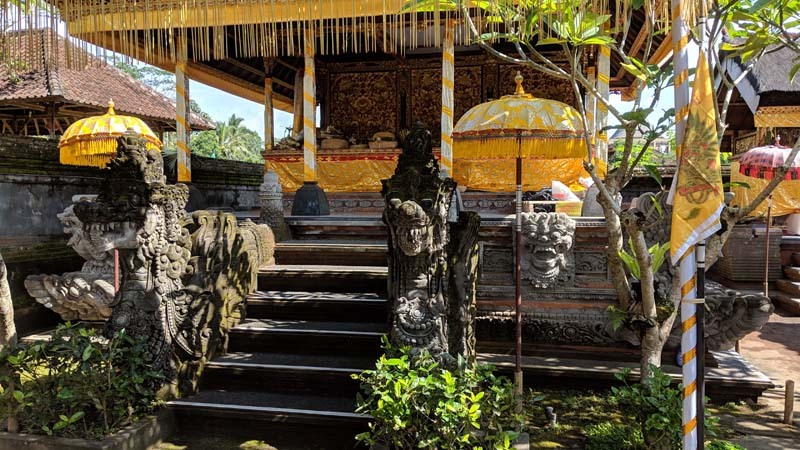 I spent nearly five week in Bali over the December/January period, so Balinese Hinduism seems like an obvious place to start. 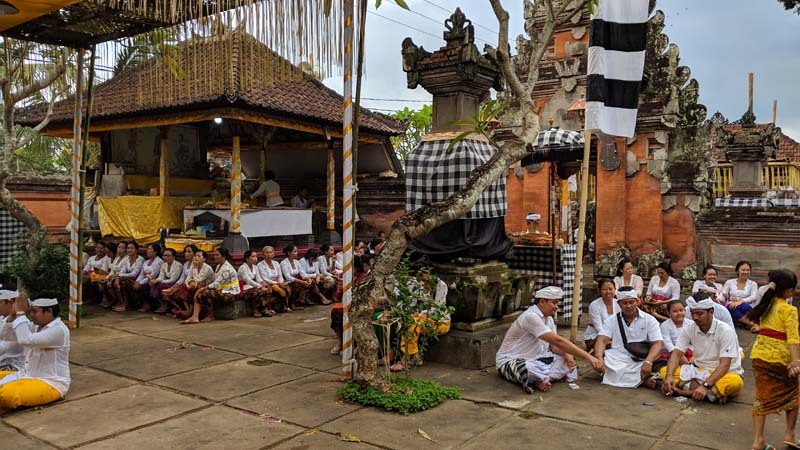 As part of Indonesia, a predominantly Muslim country, Bali is a religious outlier with nearly 85% of the island’s population identifying as Hindu. 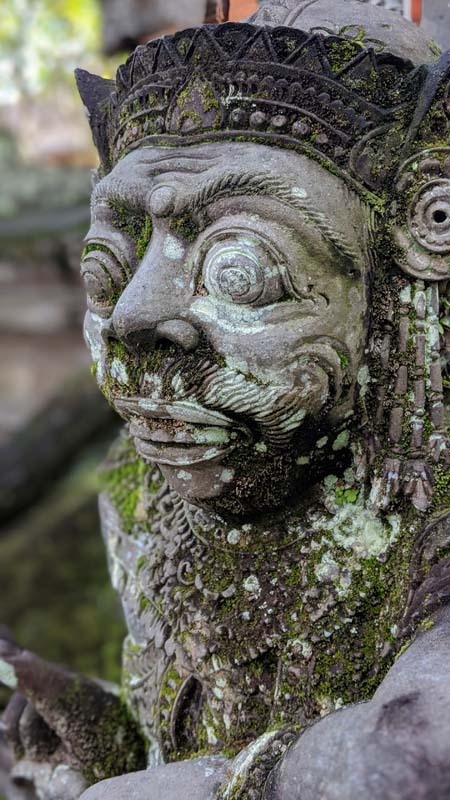 Its version of Hinduism is a little different to that traditionally found in India, which is polytheistic (believing in many gods), and it has quite a different feel to the other Muslim parts of Indonesia. 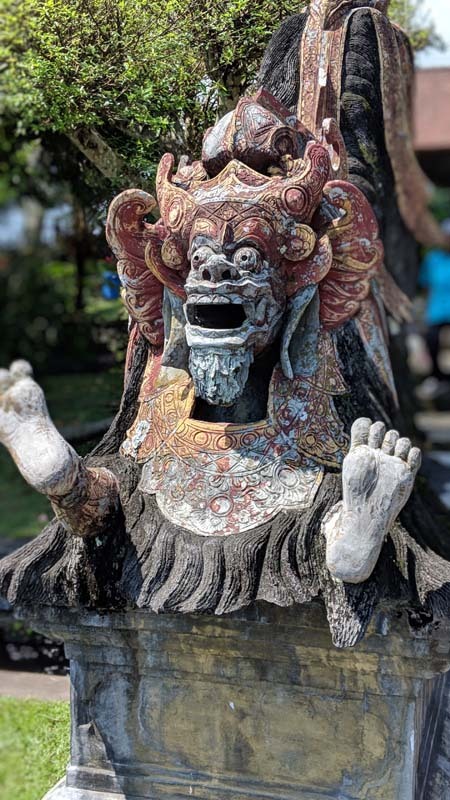 Balinese Hinduism claims to be monotheistic, with only one god, although it seems to me that in practice this is not always the case, based on so many different statues I saw everywhere. 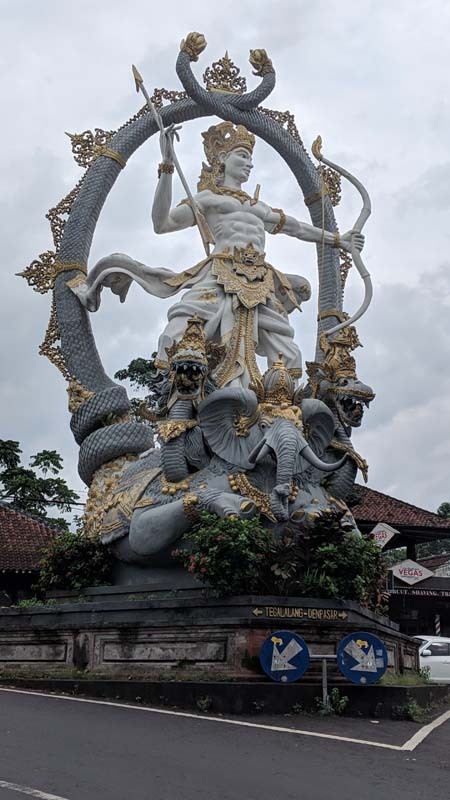 There were statues of Vishnu and Ganesha and many, many others that I didn’t recognise, so I’m not totally sure how the monotheistic thing applies. 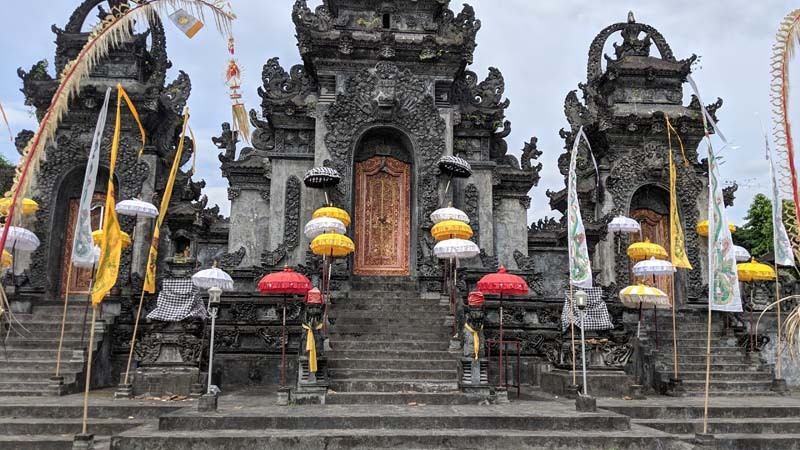 As used to be the case in India, there is a caste system in place in Bali, with priests and holy people (mostly men) called the Brahmanas at the top. Below that are the Satrias, Wesias and Sudras. 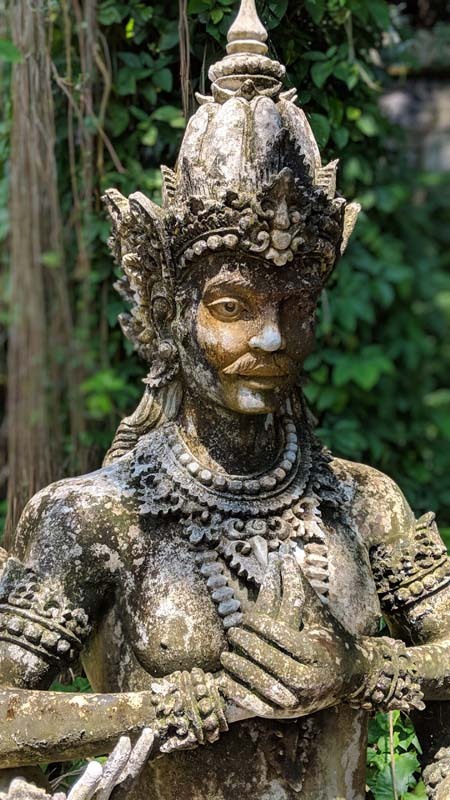 The Sudras are the common class of people, and make up 90% of the population – these are your farmers, workers, etc. There are all kinds of specific rules and conventions that get applied to you depending on what caste you belong to. 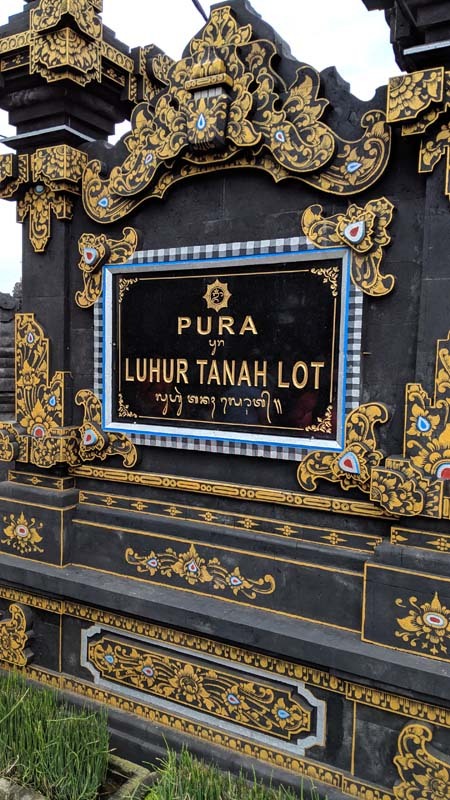 For example, the Sudra caste are given a name based on their birth order – first born is named Wayan, Putu or Gede. 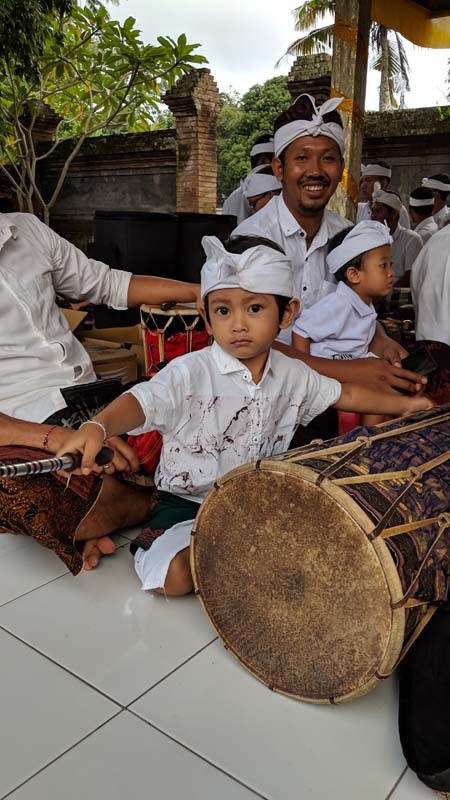 The second born is named Made or Kadek, the third goes by Nyoman or Komang, and the fourth is named Ketut. 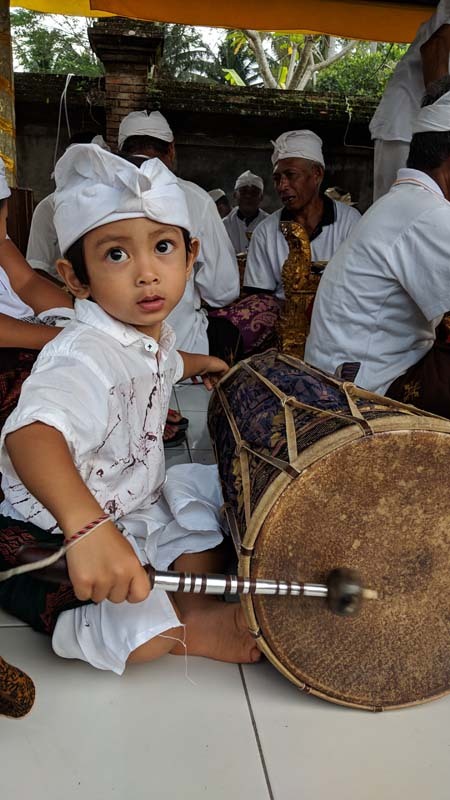 If a family has more than four children, the cycle repeats and the next ‘Wayan’ may be called Wayan Balik, which loosely translates to ‘another Wayan’. I met a lot of people with these names! 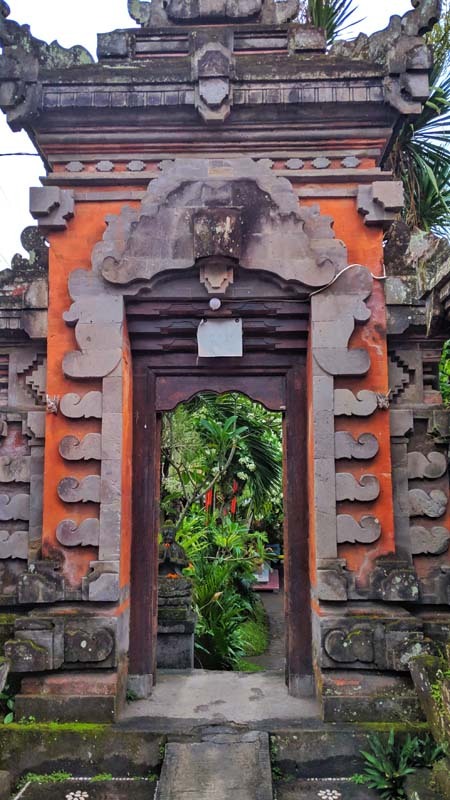 You also can’t miss the temples in Bali; they are absolutely everywhere. 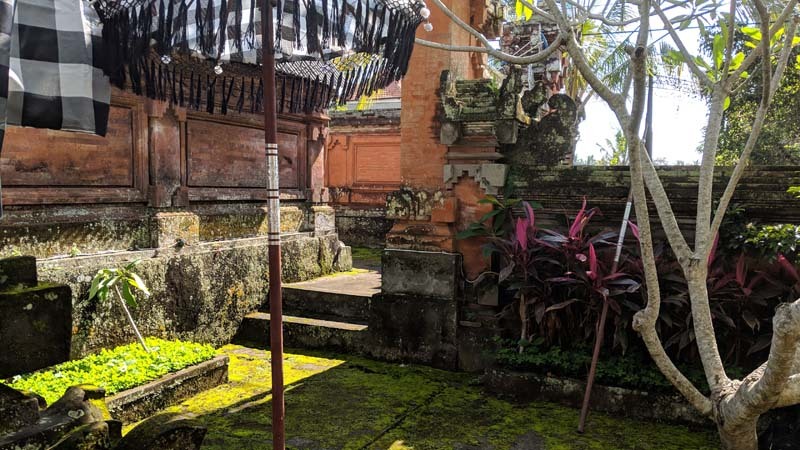 In fact, as well as the really big major temples, each area or village has several mid-sized temples serving the locals, and most people’s houses even have a small temple within the family compound. 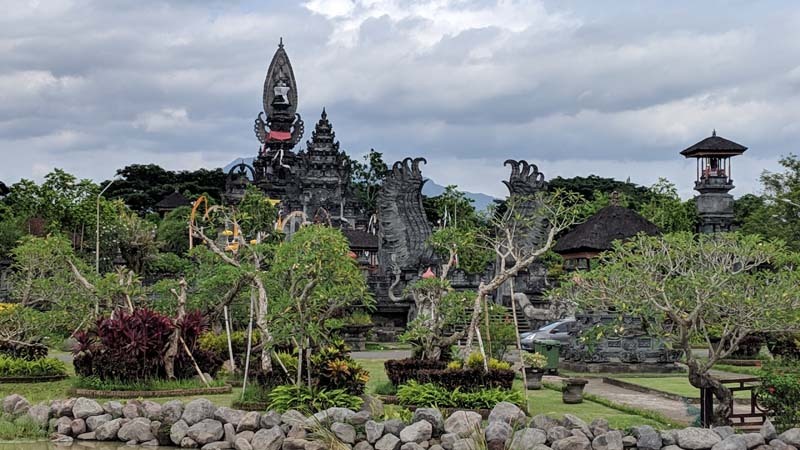 You honestly cannot walk more than a few hundred metres without seeing a temple. 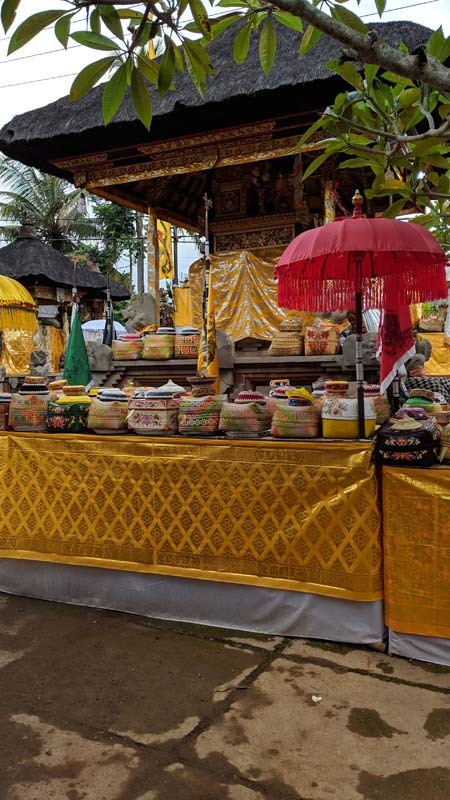 At the temples you see lots of offerings being made all the time, giving thanks to the god(s), and praying for good luck. 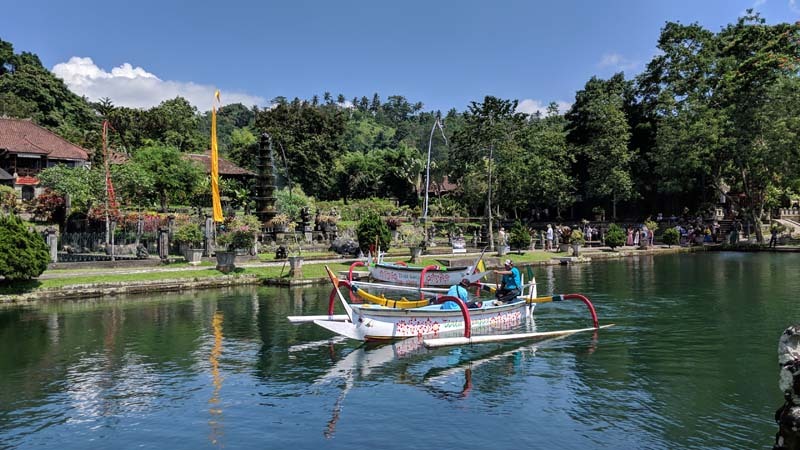 The Balinese people seem to be deeply spiritual, and the culture is fairly traditional in its expectations. 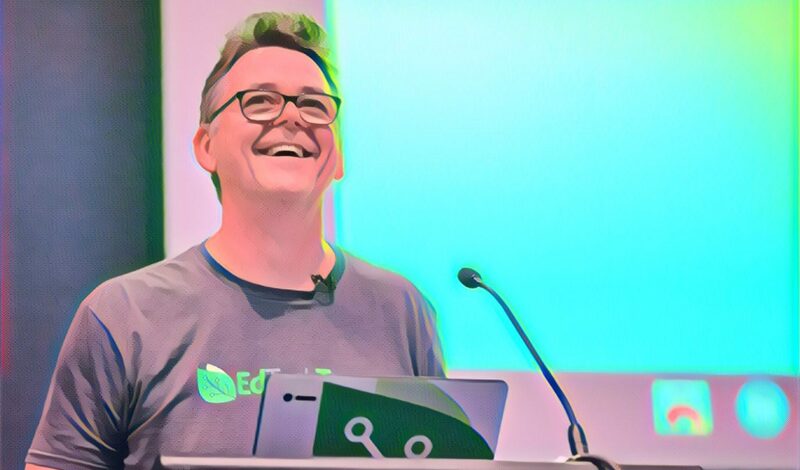 There are so many rules about how life should work, defining the different roles that men and women take on within society, how the structures of marriage and family should work, how lineage is passed down, and so on. 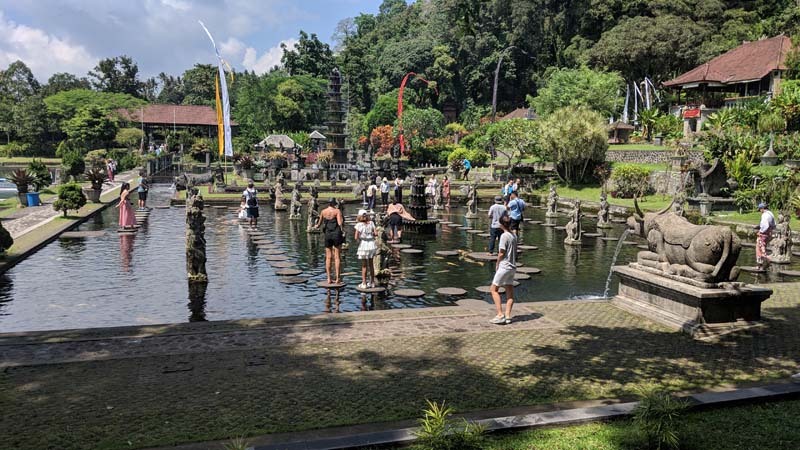 The expectations of what men and women are supposed to be and do seem quite conservative (to me) but they are clearly very entrenched and valued by the Balinese people. 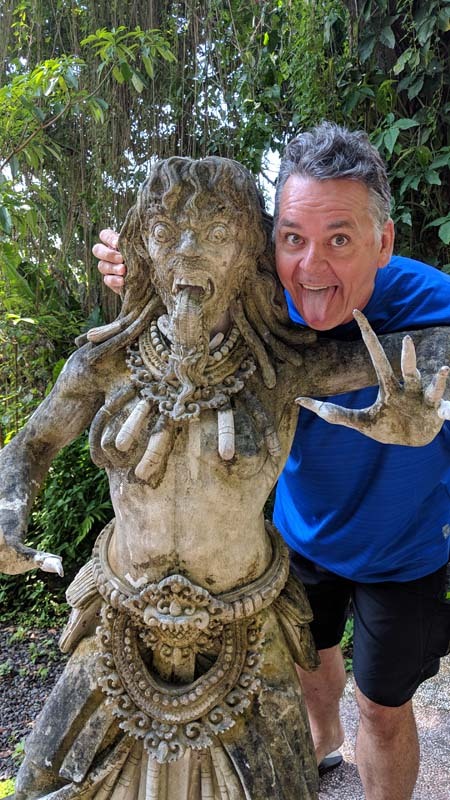 As I mentioned, you see offerings everywhere! 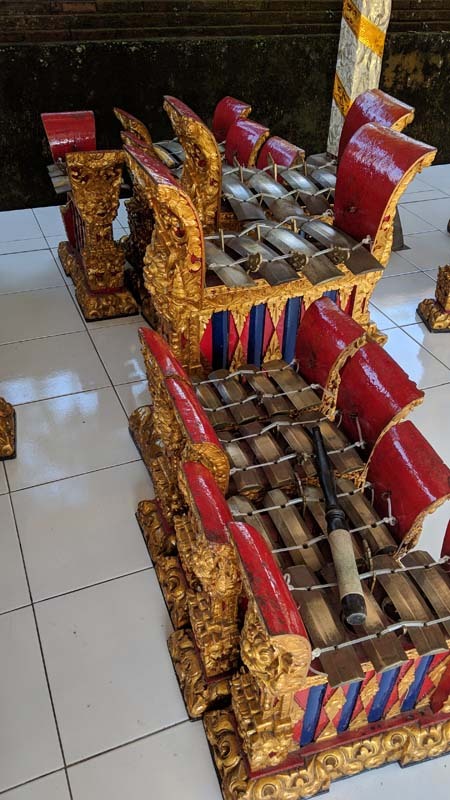 Known as Canang sari, these are usually small baskets woven from strips of palm leaves filled with rice, flowers, incense or other things, and left out in front of houses, shops, temples, beaches, in fact everywhere that needs blessing. 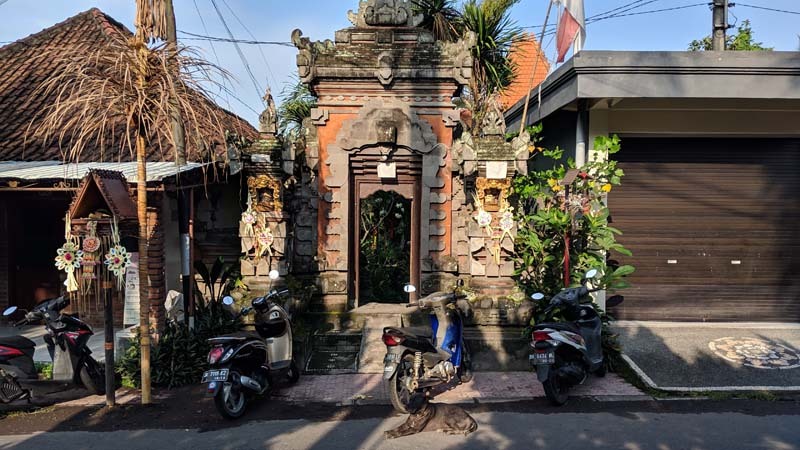 One morning while I was in Ubud, I went to get on my scooter and there was an offering sitting on the handlebars of my bike, and every other bike in the street. 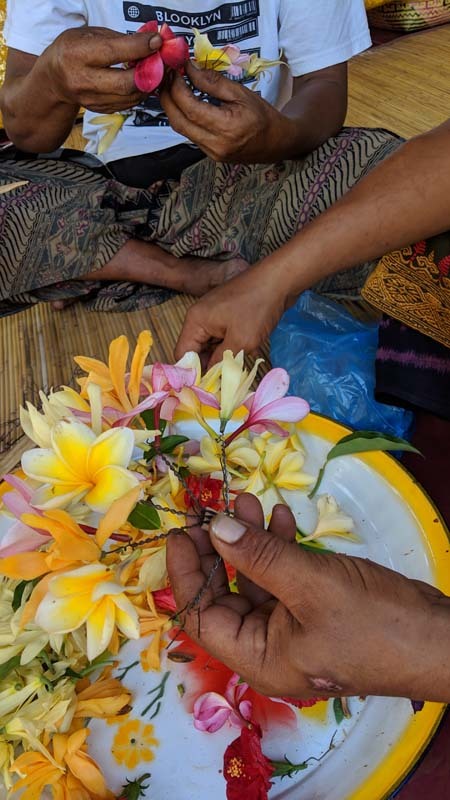 These offerings have great importance and happen several times a day, and are mostly managed by the women. They are offered every day as a form of thanks for the peace given to the world. 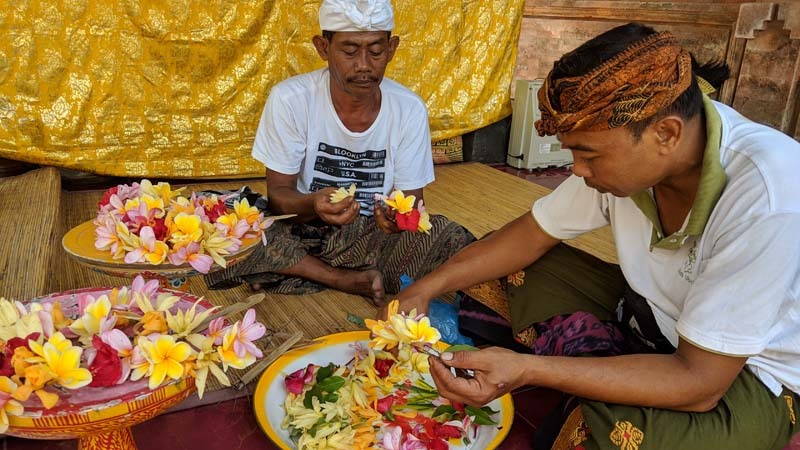 The philosophy behind the offering is self-sacrifice in that they take time and effort to prepare. I was talking to one of my AirBNB hosts who said that they go through about 50 of these offering baskets every day. They get put in front of pretty much everything, and there are times when you literally have to step over bunches of them in the streets. They are obviously really important to the people and their beliefs. 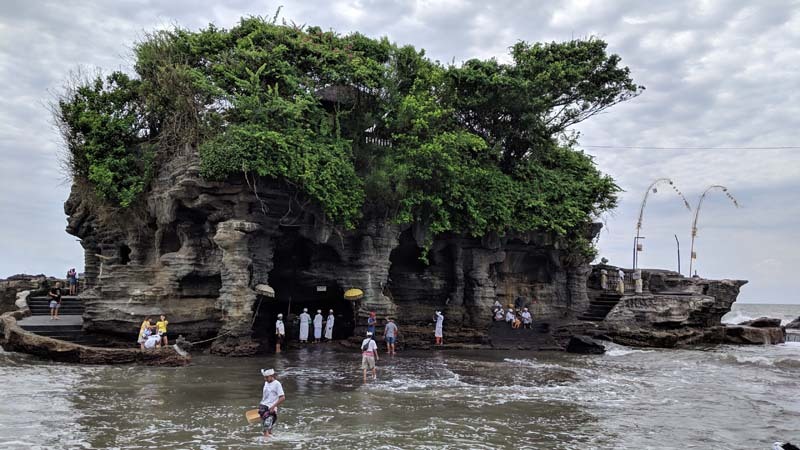 One of the more major temples I visited was Tanah Lot, a spectacularly beautiful temple on the west coast of Bali. 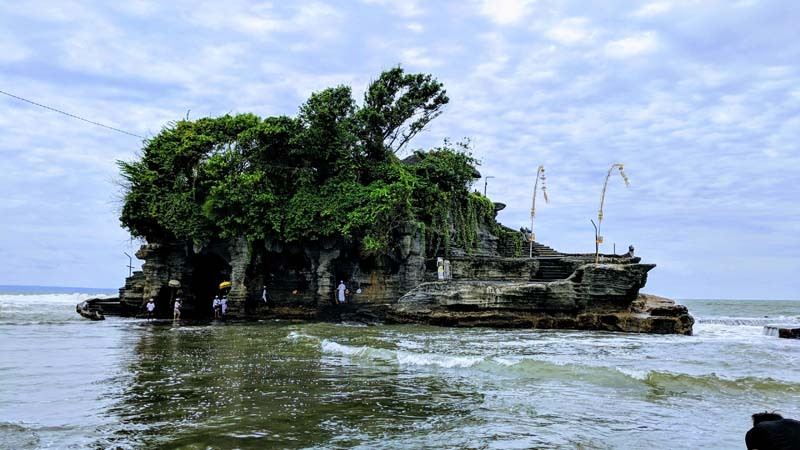 It’s built on a rocky outcrop that juts into the ocean but at low tide, you can wade across the water to the actual temple. 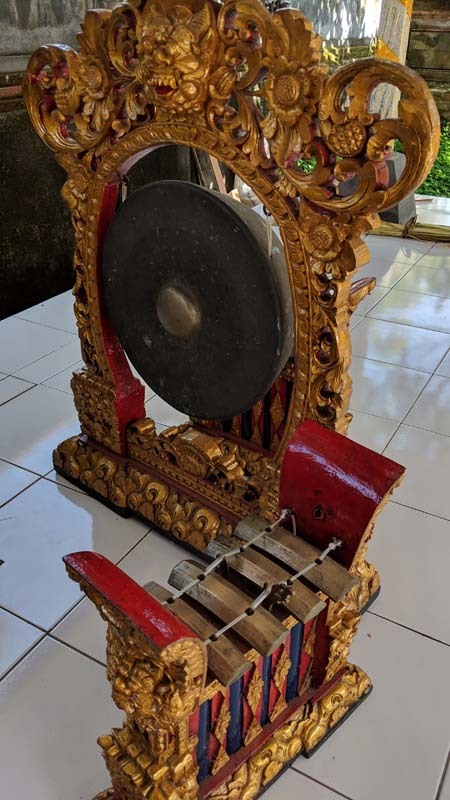 There you can, for a small donation, get a blessing from the holy men. You need to wash your hands and feet, then they stuck rice onto your forehead. No idea what the purpose it, but they all seemed pretty reverent about it. 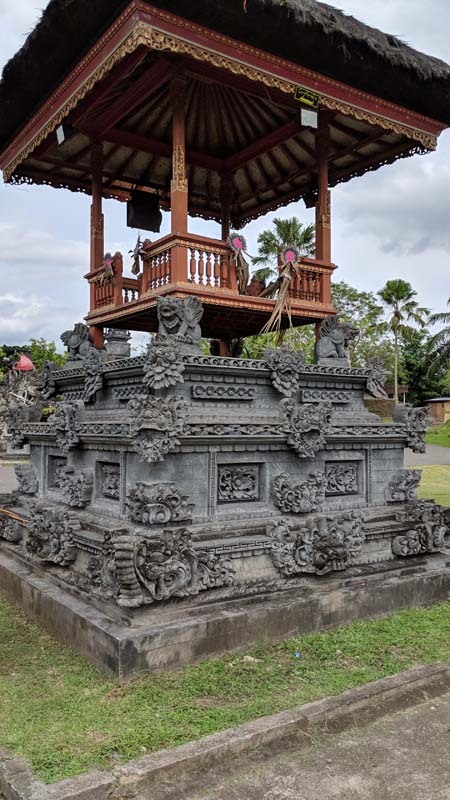 I would have liked to have explored the actual temple but it was closed off to the public. 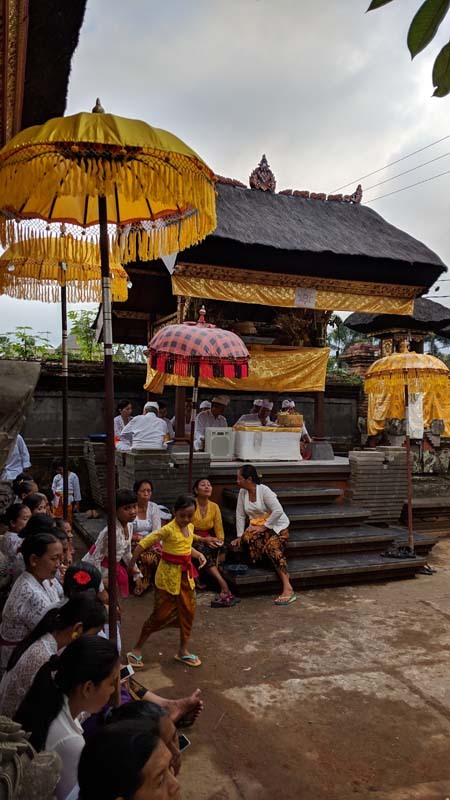 I happened to be in Bali during two of the biggest religious festivals of the year, Galungan and Kuningan. 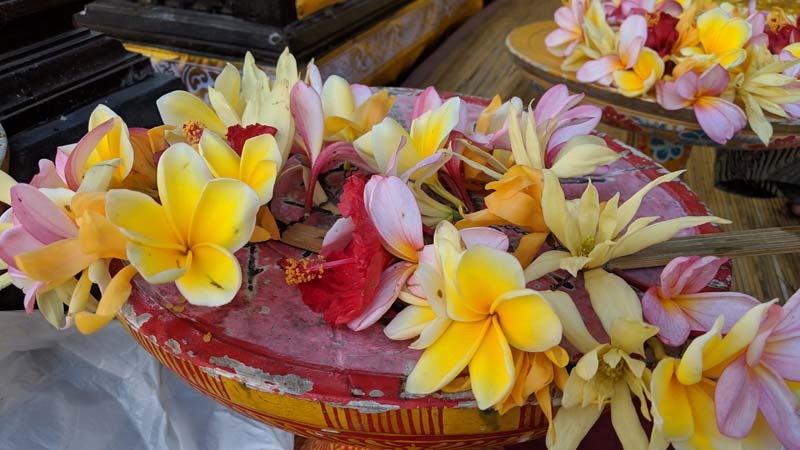 During this time, the temples get dressed up, there are big baskets of offerings being given, flowers are used to decorate the temples, etc. 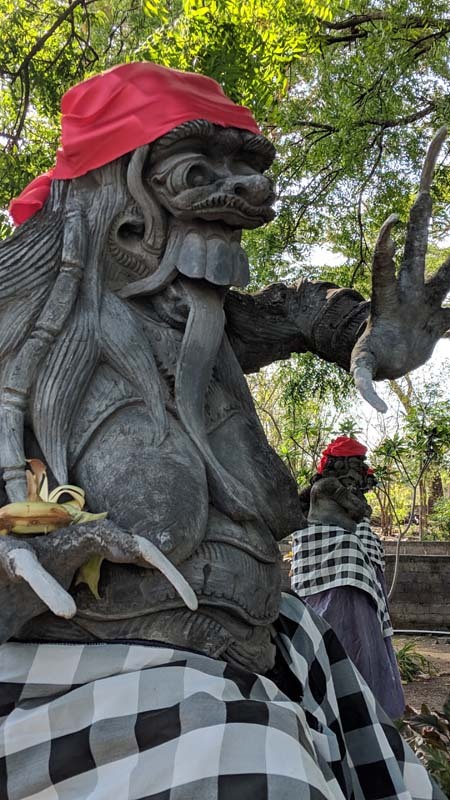 All the statues get dressed up in black and white checkered sarongs. 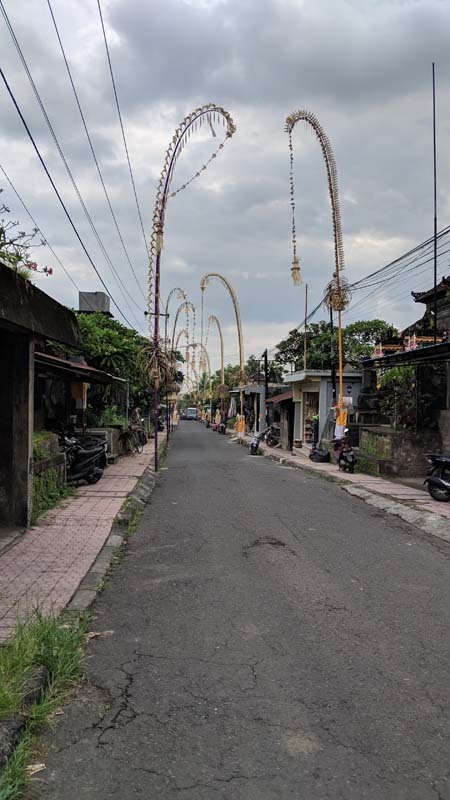 The streets get decorated with big bamboo poles. 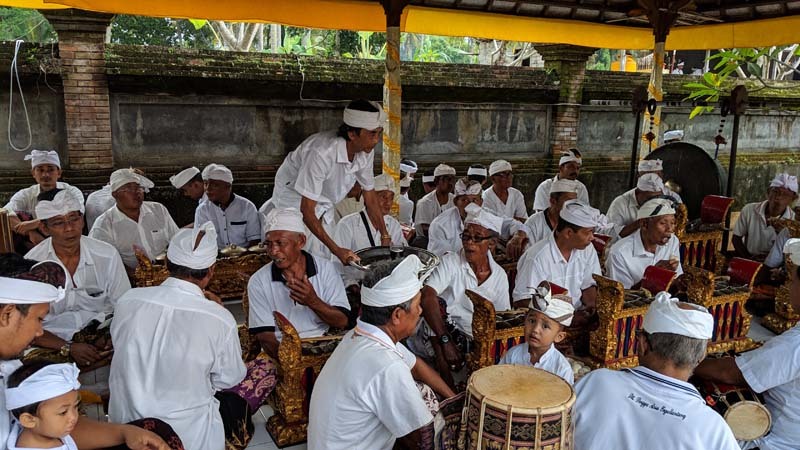 And the people gather together in the temples to celebrate, talk, play music, and give thanks. It’s all rather beautiful. 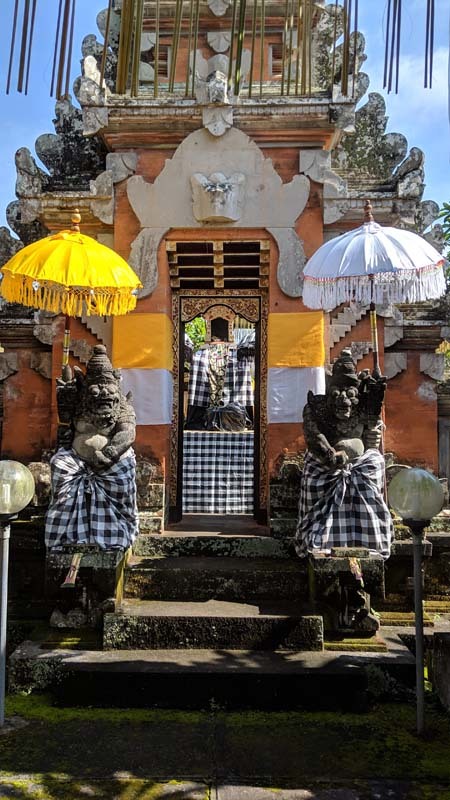 I visited a biggish local temple just outside Ubud during the Kuningan festival and stayed for about an hour just to watch what was going on there. 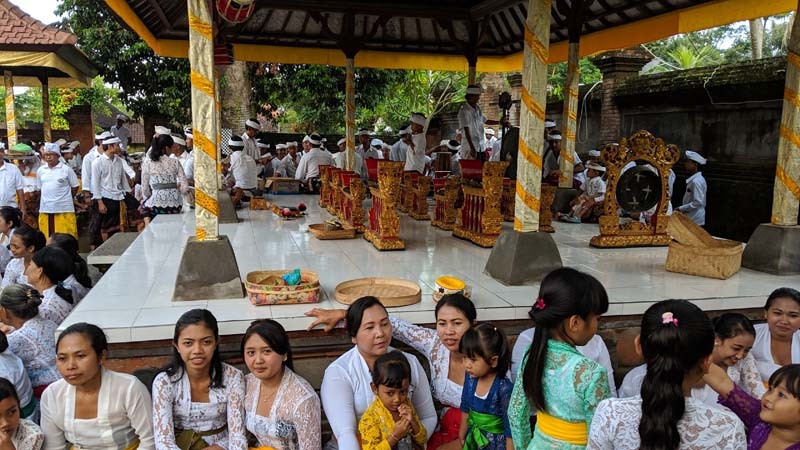 The women sat gathered together in groups, all dressed in traditional costumes of a sarong and a traditional lace top. 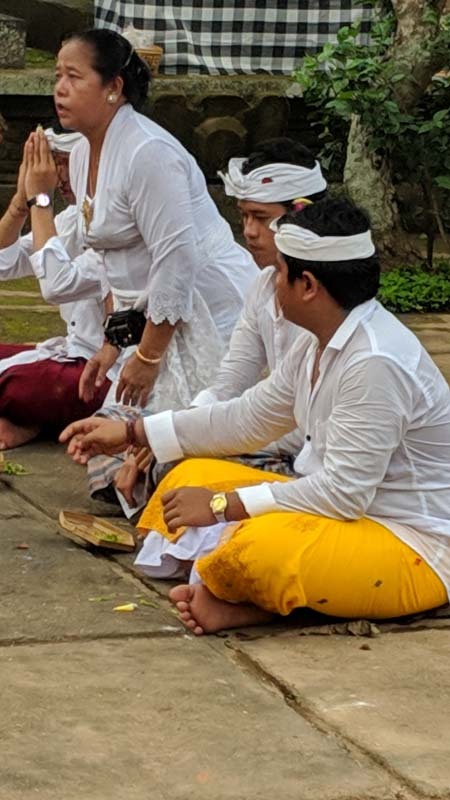 The men stayed in their groups, also dressed in sarongs and mostly white shirts. 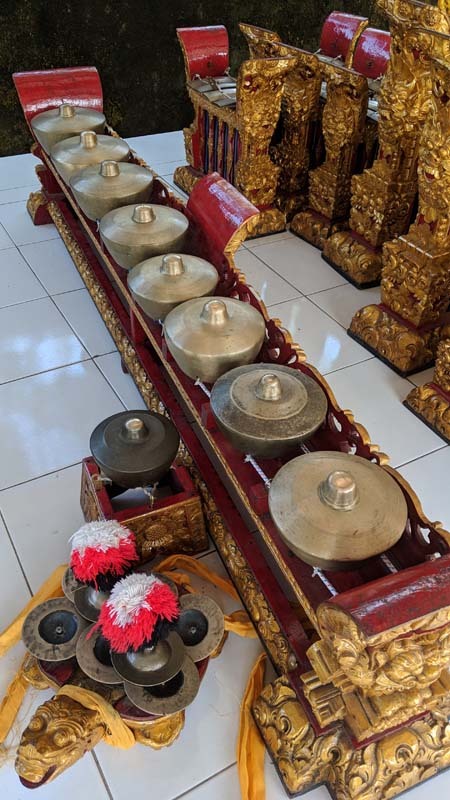 There was music being played on traditional instruments – mostly percussive instruments, so to an untrained ear it does tend to sound like a lot of banging and crashing noise – and although the banging can sound a bit random, the musicians all clearly knew what was coming next as they stayed in time and tempo and knew exactly when to vary the intensity of their contributions. 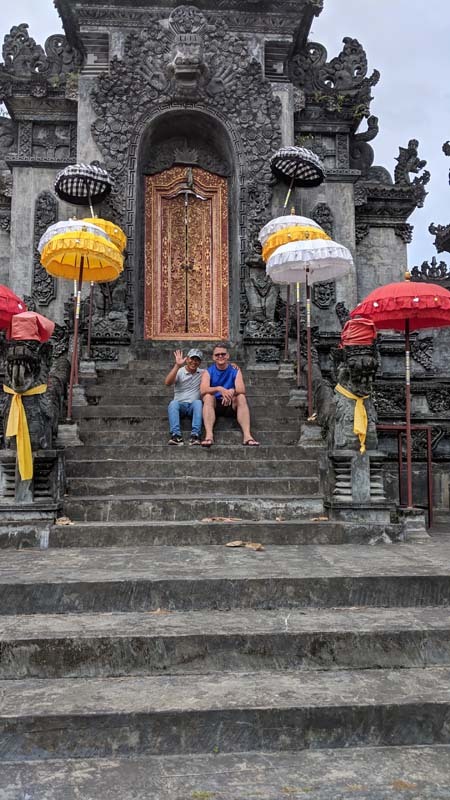 Although I wore a sarong and tried to be discreet as I wandered around the temple, I felt a little conspicuous being there. People were very welcoming though. It was quite amazing to experience. 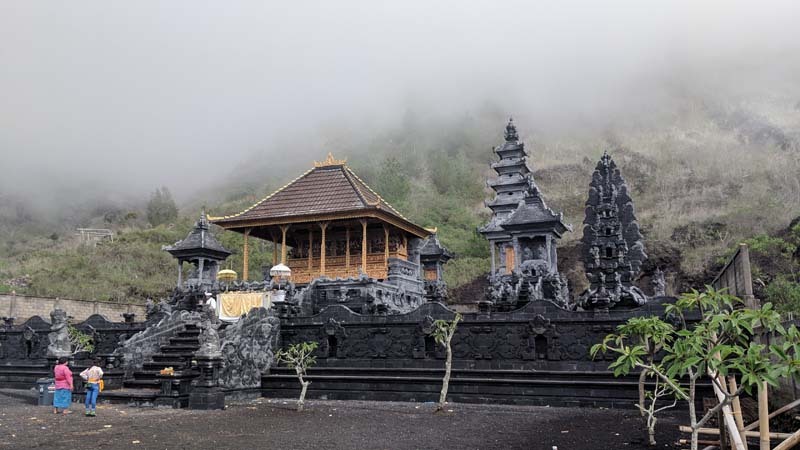 Another fascinating temple was Tirta Gangga, on the way up to Amed on the the north coast. 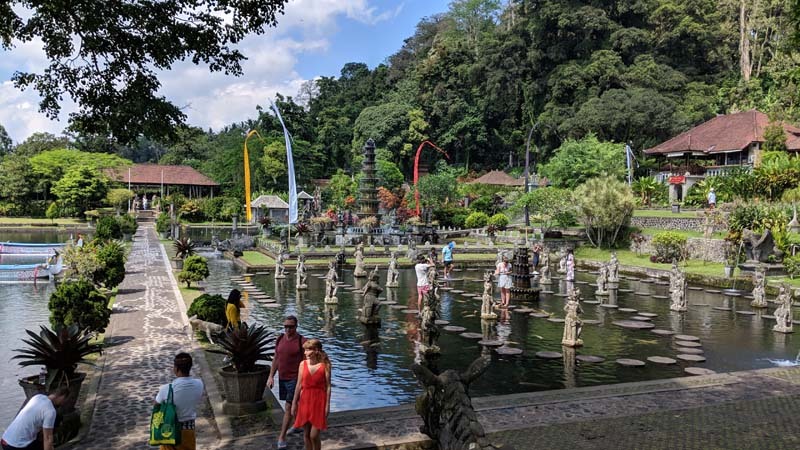 I believe the name translates as Water Palace, and it was probably one of the most beautiful temples I saw. and quite different in style to the others. 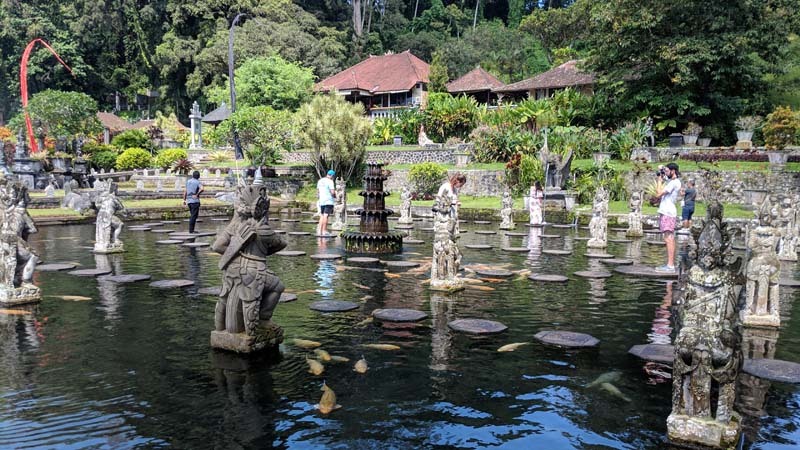 there were lots of statues everywhere, but the main feature was the beautiful waterways and ponds filled with fish. That really summed up a lot to me about the impact that Hinduism has on these people. 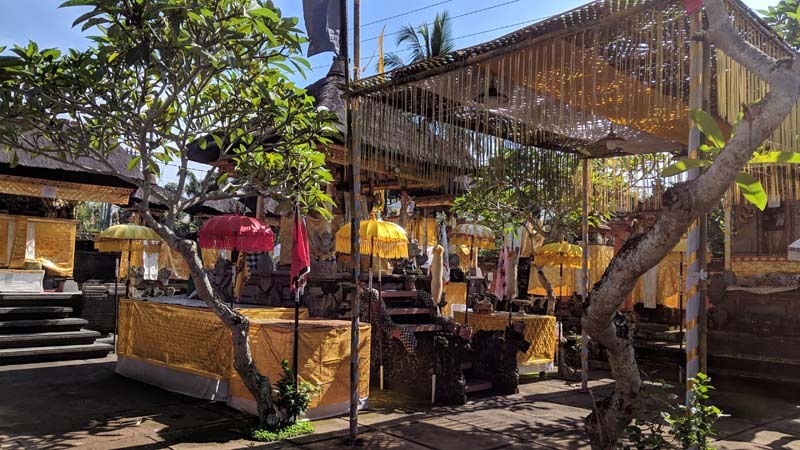 There is a genuine sense of kindness and helpfulness from the Balinese people that, I think, largely stems from this idea of karma… that whatever you do to other people and however you treat other people, it will eventually come back to you. 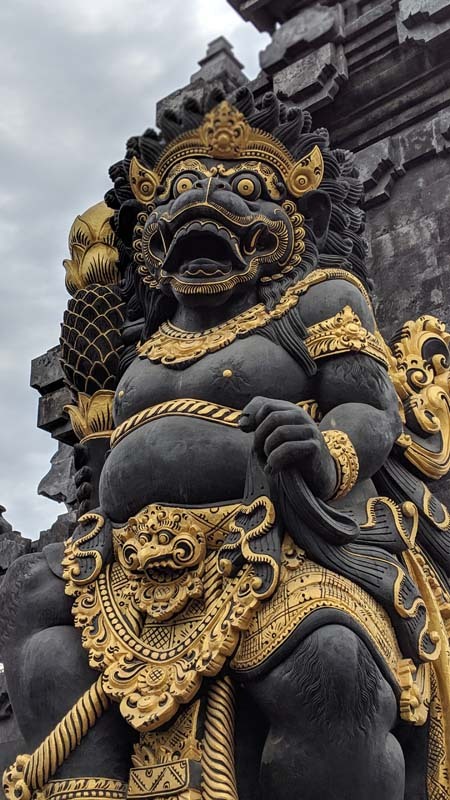 The Balinese have a beautiful spirit, and I can’t help but think their Hindu beliefs about life and the world play an important role in the way they think and act. 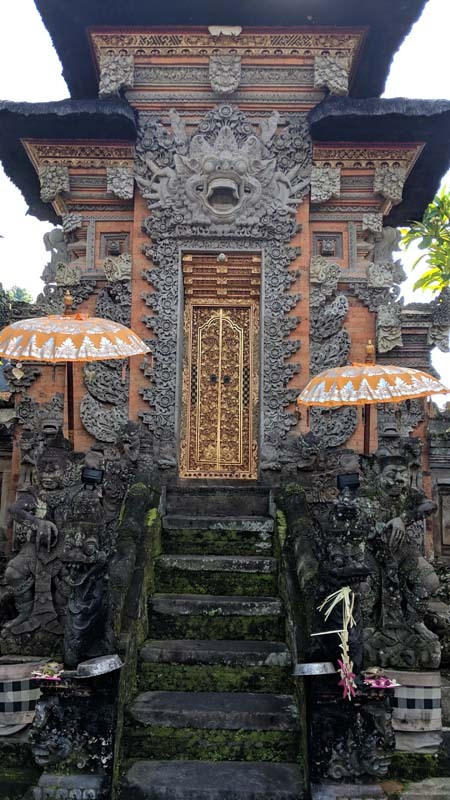 So there you go, that’s my experience with Balinese Hinduism. Stay tuned for next month where I pick another religion to check out!